In one of the more practical watch brand collaborations that we’ve heard for a while, Casio has been working with Britain’s Royal Air Force on a new range designed for use in combat. Formed in 1918, the RAF is one of the oldest air forces in the world. G-Shock approached them for input on the specifications for a watch that would actually be useful for a professional pilot. The RAF asked its pilots (helicopter, jet, air transport) about what they wanted in a watch, and after the (much shortened) final list had been compiled, the RAF met with Casio’s R&D team and came up with the final specs. Some items that the pilots wanted, such as a torch, were excluded from the eventual design. There was one overriding request from the RAF – that the watch be discreet, with no metallic surfaces (including buckles) because of reflection, and in a shade of grey that would be between the two types of suits worn by their pilots. The foundation of this G-Shock is the Casio ‘Triple G Resist’ technology : shock-resistant, vibration-resistant, and resistant to centrifugal gravity. Added to this is something called ‘Smart Access’, described as an analogue movement where each of the three hands are controlled by individual motors, allowing the face of the watch to display different types of information. Functionally, ‘Smart Access’ will be able to do nifty things like allow the watch to measure the temperature in the flight cabin, using the hour, minute and second hands as indicators. The case of the watch will include a shock-resistant electronic crown and quick-lock rotary switch so they can’t be activated by random contact with hard surfaces. The hands on the watch are also longer than G-Shock’s normal ones, at their request. Accuracy-wise, it’s all about atomic timekeeping from the signals of the six atomic clocks worldwide. 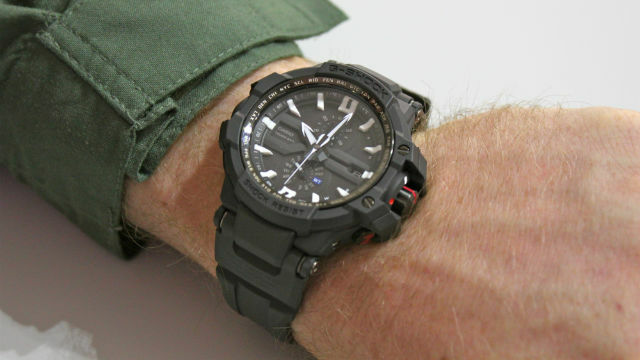 If nothing else, this will chew up a lot of power; the RAF watch will be solar powered and have a rechargeable battery. 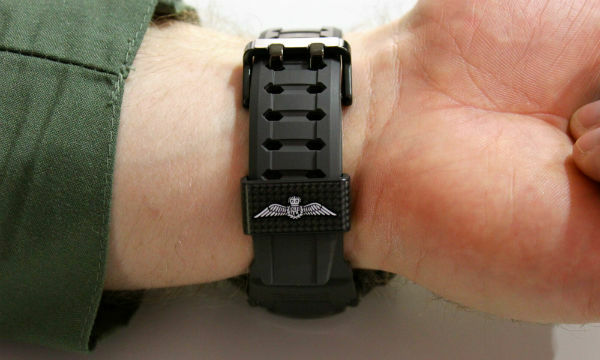 Obviously, being a watch designed for such use, it’s considerably more low key than many of Casio’s G-Shock offerings, but for those who know where to look, there will be one obvious identifying mark – a carbon fibre resin keeper on the strap will be decorated with the RAF ‘wings’ logo. Rather dramatically called the “Gravity Defier” (Ref: GW-A1000RAF-1AER), it is being released in a limited edition of 2000 and will be on sale from June 2012 for GBP500. A rather expensive G-Shock, but I reckon it’ll sell out. with thanks to your blog post on this watch, i’ve found the G shock (ordered a week ago and delivered yesterday) that i’ve always wanted, but never knew existed. this one’s more to my liking – aviation focused and it even has a thermometer which is so awesome! thank you! Thank you for reading and listening 😀 Hope you’re having fun with it and thanks so much for the comment, Kewps. Just found one for list price in Okinawa Japan!!! Bought it without hesitation. Thank you for the review and helping me get over buyers remorse. That’s amazing that you found one at list, a friend emailed me a link only recently of one that someone is trying to sell at a marked premium. I hope that you are enjoying it and thank you so much for telling me!